Art Lesson: Create Your Own Mandala Art! What are you doing in your art class this week? I wanted a project that would help reinforce the concept of symmetry with my students. I thought Mandala art would be the perfect project and with the coloring-book craze right now, Mandala is all the rage! Now you can have your class do it with this easy template. I can’t wait to try it out with my class. “Mandala” is a Sanskrit word meaning “circle” or “completion”. It is often recognized to represent wholeness.Which shapes and colors will you use to express your whole self? The best thing about creating your own Mandala art is that you can choose any shapes and colors you want. Make one or more than one, but the important thing is to have fun! Here’s how you can have your students create their very own Mandala art in class using this template that I made for you. Good luck! Come back and send me some pictures of your class creations. I’ll post them on the site. It’s fun to share! 1. Cut out along the black square lines. 2. Fold in half along the center vertical line and then open and refold along the center horizontal line. 3. Now fold along each straight diagonal line and unfold again. 4. Starting from center make a design in only one “pie-shaped” piece of the circle. or use a Mirra board along each dotted line and try to duplicate the original design in each section. Now how do you get the template? Easy. If you are a subscriber to my newsletter, then you get my fabulous freebies. It’s totally free and I promise not to share your email with anyone else. I respect your privacy and I hate spam, too, so I won’t do that to you. The best part about signing up is that you’ll also get all the FUTURE FREEBIES that will come to your inbox with the Quest Teaching Newsletter! I can’t wait to hear from you! Download the free app onto your ipad. Hit + Create a New Story. It will prompt you to give a name to your project. Just type it in. Then it will give you a variety of story structures to choose from: Share an invitation, Promote an Idea, Tell What Happened, Explain Something, Follow a Hero’s Journey, Show and Tell, Teach a Lesson, or Make Up Your Own. Just click on one to get started. Now you see a screen that lets you add an icon, a photo or text, or any combination ( by clicking on layout at the top you can add more than one). You can choose a photo from your ipad gallery, take a picture, use dropbox, or search for royalty photos on the internet right from the app. Make your choice to add it to the slide. Then hold down the record button and speak your narration for the picture. There’s a playback button to hear the results. If you don’t like them, just hit record again and try again. It records over your first attempt. It won’t take long to get it right. That’s it! That’s all there is to making a slide. The app automatically puts a blank background and background music behind with your slide, but you can easily change all, if you like, by clicking one of the features at the top: Layout, Themes, Music. All are easily customized with simple clicks. You are done! Now you can share to Facebook, twitter, etc. or download to the cameral roll to save it to your PC for sharing. It’s just that easy! As always, if you have questions, I’m here. This author has a passion for explaining how to do things, and she displays a definite talent in this area. 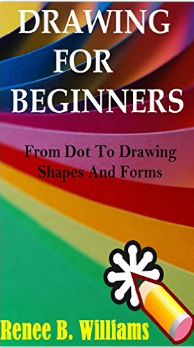 Adults who have always wanted to learn how to draw or those interested in helping children learn will find value in this book. The step by step approach laid out in the Table of Contents sets the tone for this book of approximately fifty pages. As educators, I believe that each of us aspire to be a role-model and a source of inspiration for our students. Today I’d like to share with you the story of one teacher who more than achieves this goal. Maybe her story will incite you to keep on making every effort to inspire your students. Ms. Barnes with Gabriel, just one of her many students. A young boy stands waiting in the wings, legs shaking as his name is announced through loudspeakers. His palms run up and down the sides of his thighs, trying to keep them dry. This is the moment he’s been thinking about, preparing for, and anticipating for months. Here it is. Is he ready? You can do this, you’ve got this, he hears her encouraging words repeating over and over in his head. His shoulders rise in a deep breath as he shakes his hands at his sides one last time. The adrenaline forces his legs up the stairs, onto the stage and over to the mic. The audience stares, waiting. Panic. Can he do this? Another deep breath and a shake of his hands to calm his nerves. He spins around to see her sitting there, behind her keyboard. She smiles, gives him a nod, and mouths the words, “You’ve got this!” He nods and the music plays. In that moment, all the hours of preparation come together and his performance takes flight. As his ears fill with applause and cheers, he takes a bow, knowing that he will never forget this moment. Exiting the stage, he glances back at the one who believed in him, and gave him the wings to soar. This smile is just for her, his mentor, his teacher, and his inspiration. She smiles back and bows. Her pride in his performance written all over her face. But this night, and this moment, didn’t just happen. It is the culmination of vision and sacrifice. Waiting to perform at the gala! The anticipated event is the annual Fine Arts Gala. Each year a dedicated group of educators in our school put on the event to help celebrate the fine arts talents of the students at our elementary school. The evening is billed as a fancy gala. It’s really quite a sight to see; tickets sold to raise money for a charity of choice, h’orderves served by students dressed in their finest, tables and walls filled with the stunning art of students. Yet, the event’s appeal goes well beyond the atmosphere and display; the gala performances are some of the most anticipated events of the year. The crowd will take their seats, the lights will dim, and the spotlight will shine on each young star. And who is in the background, hiding behind the keyboard, making sure that each student has that spotlight for the evening? Ms. Barnes, that’s who. For the last three months there’s been practices sessions with students every recess break, and after school. If one would take note, many youngsters would’ve be seen going to her home to practice into the evening hours. Her commitment doesn’t end there. Hours of planning and preparation are put in by Ms. Barnes and her committee: meetings, contacting parents, labelling and mounting art, setting up displays, decorating, sound equipment, lights, readying the stage and making sure everything is perfect. All must be ready for the special evening. Ms. Barnes leads her committee to make sure it is. Why? Because Ms. Barnes loves music and art, but most of all, she loves her students! Whether it’s for the Fine Arts Gala, Christmas concert, or the annual spring musical, her love is evident and played out in the countless hours she donates freely to encourage, inspire and give her students wings. In an age when the importance of the arts may sometimes be downplayed, Ms. Barnes seeks to inspire her young students to have no fear when it comes to sharing their talents with the world. She’s not only an extraordinary keyboardist, piano player and teacher; she’s a mentor. By giving her students wings, she hopes that they, in turn, will inspire others to share their gifts. Watching the dedication and love she gives freely, inspires me to be a better teacher, too. Thank you, Ms. Barnes for sharing your gifts with all of us! 1) Set up auditions. Students must be committed to a giving a practiced well rehearsed performance. If they don’t practice, they don’t perform. 2) Art club: teachers on the committee agree to supervise art club once/week and guide students to put sketches into the gala. They are provided with pencils, a sketchbook, and an art eraser. They will choose one best piece that they want to enter. That will be mounted and displayed in the gala with their name. 3) Open up and supervise the music room for practice and feedback times during recesses and lunch hours. 4) Enlist the older students as servers for the evening. 5) Get the help of parents to make h’orderves ahead of time and bring them to school on the date. 6) Have classes contribute class art projects to the gala displays. 8) Invite other schools to participate. Our high school student contribute both art and performances for the evening. Finally, the preparation is done. It’s time to sit back, and watch the students fly! It really is inspiring! Listen to Ms. Barnes in action! Here she is working (playing and providing harmony) with a young student, inspiring her to love music and performing. Tying art to literature and real life is a beautiful thing in the classroom. This week my class was all a “buzz” with wonder as we read chapter 33 in The Jewel of Peru. As the main characters made their get away on a plane, they looked down to see the Nazca Lines. My students were instantly engaged with mystery surrounding these ancient geoglyphs and wanted to know more about them! I’m always looking for ways to integrate the subjects because I’ve seen how effective integration can be in helping students make connections in their learning. Art class this week provided me the perfect opportunity. We have been learning about contour drawing and a study of the Nazca Lines was my hook! The students were enthralled to learn more about the lines and they were eager to try to practice their contour drawings by trying to reproduce the various labyrinth geoglyphs on paper. Taking it one step further, we then discussed ways we could add color using different mediums and compare them. They used waxed crayon, marker, and pencil crayon to make comparisons between the effects they could get with each one. Expanding upon the lesson, we may explore other mediums and build our contour labyrinths with clay and or paint, which will, once again, provide a basis for comparison. This activity brings together, literature, history and art and helps make the connections between them for students. Try it in your classroom, too! After all, isn’t it our job as educators to model help kids make these connections and foster a love for life-long learning about the incredible world around us? Novel Approach to Engaging Students in the 21st Century. Is newer always better? Join young Captain Faramund and the Stowaways on a Journey to save the Earth’s treasures! Whether I am discussing with colleagues, attending professional development sessions or reading teacher blogs, the conversations inevitably centre around how we can find “new” ways to engage the learners in our classrooms. What works. What doesn’t. The conversation is not a new one. I’ve been a teacher for eighteen years now and can attest that this topic has, and likely always will be the main focus of discussion in education. Why? The answer is obvious: The reason that we teach is that we want our students to learn! I am a strong advocate for continuing the discussion and inviting change to our education system where it is warranted, and I applaud the many individuals who are continually trying to make our “systems” better. However in this post, I want to pose the question: Is new always better? Let me explain. What I am trying to say is that some teaching methodologies are tried and true. They have always worked and always will. They have always engaged learners because the technique employed has universal appeal. I believe that one such technique is story telling. Everyone loves a good story and everyone goes away from a story, having learned something new. The oral traditions of the indigenous peoples had it right! They used the art of storytelling to help their youth connect to real life situations and learn from them. Through story, games and real life experience everyone learned what they needed to know to function in their world. Why is story so effective? Because a good story allows us to connect with the characters and see, feel, hear and experience through them. “Story” involves emotional connection and emotional connection activates learning! This is the very basis for my novel, “The Jewel of Peru” and the concept of Quest Teaching. I asked myself, What if I were to write a novel that uses the curriculum as the plot and allows the students to use the story to connect the concepts they must learn? Of course the story must exciting and engaging literature first, also curriculum centered. In the Jewel of Peru, I believe I have achieved it! The story brings the magic of the age old art of storytelling into the 21st Century classroom by deliberately weaving the social studies and science curriculum throughout the plot. If you must teach your students about environmental responsibility, rocks and minerals, building and structures,hearing and sound, animals, community, quality of life, global connections, or geography and resources, then this novel has it all! In my classroom the result has been amazing. My students loved it! A free preview of the first chapters can be found at: http://www.teacherspayteachers.com/Store/Quest-Teaching Try it as a read aloud to use as a hook for your lessons. It works! As educators I say that we use the tried an true methodologies that we know work, but continually strive to use present technologies that allow our students to engage with the concepts in meaningful ways. A strong marriage of current technology and existing best practices will yield a beautiful family of life long learners! Storytelling aids children in literacy and comprehension by making visual and mental connections with the story being told. Exactly! It’s such a powerful tool in our teacher toolbox! I intended to post you that bit of observation so as to say thanks as before for the gorgeous tips you’ve shared on this site. It is remarkably generous with people like you to deliver without restraint what exactly many of us would’ve distributed for an electronic book to earn some profit for their own end, most notably since you might well have done it if you ever decided. These smart ideas also served to be the fantastic way to be aware that the rest have the identical keenness similar to my personal own to know the truth a good deal more pertaining to this issue. I’m certain there are a lot more fun situations ahead for individuals who view your blog.